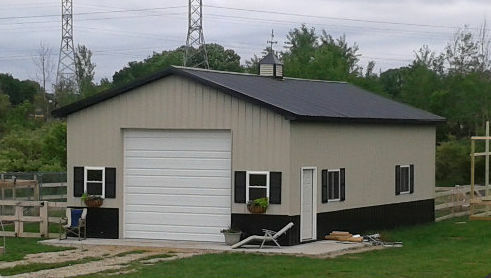 Constructed in Lapeer Michigan, this building features a 12x11 un-insulated CHI overhead door, (4) 3x3 slider windows with black shutters, and (2) 3x2 sliders with shutters. One 3068 entry door, vented soffit and ridge are accompanied by a 24 steel cupola with rooster weathervane. Roofing is 29 gauge shiny black 9" rib with stone siding and shiny black wainscot and trims. Our steel panels come in 24 colors providing options allowing matching roof and wainscot, with complimenting wall color offset by trim to suit you preferences. All packages include detailed building plans, a how-to guide and free technical support during the construction process. We can erect your garage quickly and efficiently at a reasonable price which includes top quality workmanship and premium materials. Our crews are professional and build each structure as if it were their own. You get personalized service with APB and a quality building that lasts, all for less cash. Simply complete a design online, or email back a quotation you receive in your inbox for an installed quotation within 24 hours. Looking for attic trusses? Or maybe a gambrel roof? Any custom requirement you have we can provide the materials for D-I-Y construction or build it for you. Give us a call at (210) 650-2276 or contact us via email for a quotation.